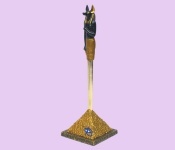 Open your mail in style with our 9.25 inch Anubis letter opener complete with a pyramid stand. Made of cold cast resin, this gorgeous piece sits well on any desk and it's fully functional, too! We've discontinued this item, we discovered after we ordered it that the actual letter opener blade was quite soft and bends easily. We notified the manufacturer of the defect. Our quality assurance team focuses on the best products at the best price. If the defect in this item is corrected we will be happy to stock them again, but we have a responsibility, to you, to carry items that are superior.